Attaching My MacBook Pro to TV Update. Now I have replaced my older MacBook Pro with 15" 2017 Model which has Thunderbolt III USB C connectors I have purchased a USB C to HDMI cable and all works fine. However we usually just use iPhone or iPad and Airplay programs to our also new Sony Bravia TV. 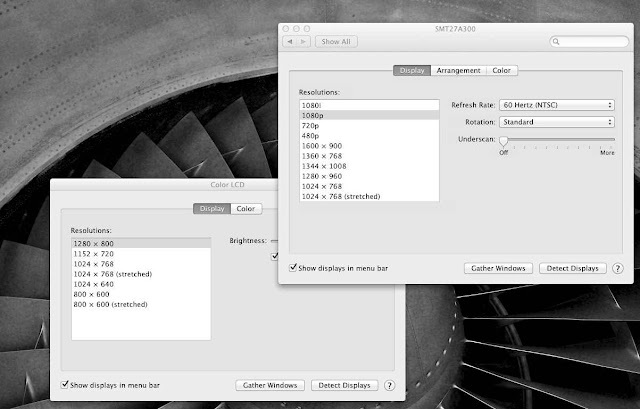 I can also AirPlay Mac to TV but seldom do this. One thing I cannot do is play DVD through SuperDrive external drive and AirPlay to TV via MacBook. So I connect with above HDMI cable and use TV as second screen. Unfortunately the sound does not play on TV but still plays through MacBook but the sound quality is OK from this MacBook Pro. I recently purchased a new TV, Samsung T27A300 very nice full HD capable TV. 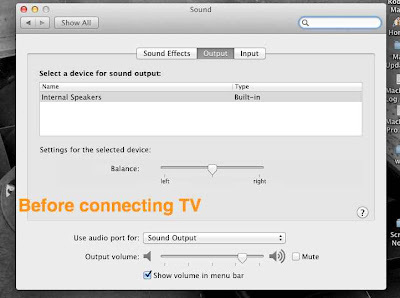 We often watch programs from BBC iPlayer either streamed or downloaded but after I upgraded MacBook Pro (early 2011 13" i7) to OS X Lion we lost the ability to hear the sound via the TV and had to return to connecting audio via audio output and Bose speaker with standard audio cable. I now suspect that this loss had nothing to do with Lion update but me switching cables at the same time. I resolved to sort this out as my old TV speakers were faulty and we used the Bose but now I wanted to use TV speakers. This is what I had to do to get it to work. The cable to connect the MacBook to TV was a DVI to HDMI cable connected to Apple mini Thunderbolt to DVI cable (in fact a cheap OEM equivalent). The TV came with a similar DVI-HDMI cable so I switched over to this and managed to get vision working (see below) but still no sound. 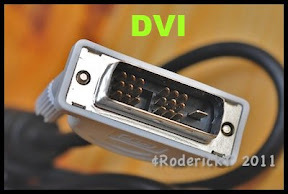 A bit of Googling later and I discover that DVI connectors do not have a sound channel and you need a HDMI-HDMI cable. So off to Tescos and I bought a 1.5m cable for just under £10. As described below this worked fine. 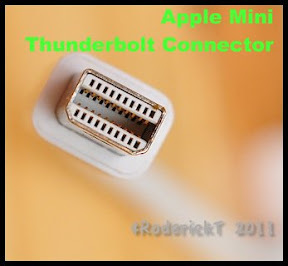 I already had a spare Apple mini Thunderbolt to HDMI cable (again a cheaper OEM brand). 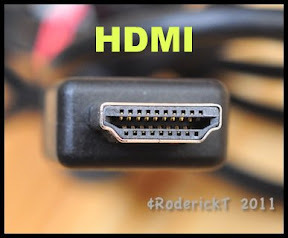 I now think I sold the HDMI-HDMI cable with a recent sale of my older desktop pc complete with monitor and this might explain why the sound originally worked because this is the one I used before upgrade to Lion. I connected TV to cable using the left hand HDMI connector as you look at the back of the TV as advised in the Samsung instructions. Then on the TV I made sure this was selected as source. 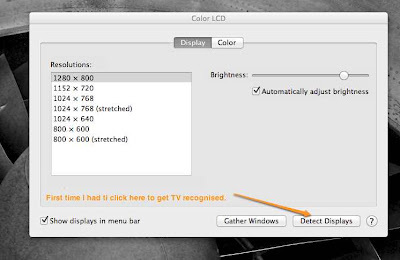 Nothing seem to happen until I clicked on detect displays and suddenly the TV showed the OS X desktop at 1080p resolution. Of course if your TV supports 720p then this is probably selected. I have not had to click on this again for subsequent use even though I have removed MacBook from cable and then reconnected a few days later. 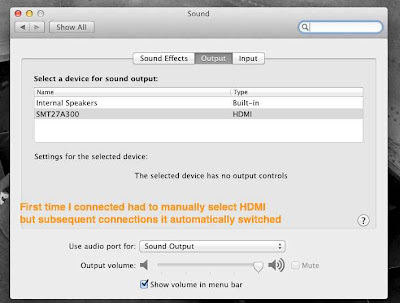 I saw that the TV was detected as a possible sound output but had not been selected. Once I did this hey-presto all worked fine. Again this was remembered by system so that I did not have to do this again for subsequent connections. And here we are watching BBC CBeebies live stream through iPlayer complete with sound.